Hello Everybody! I'm glad to have you here today because today is another fabulous Creating Kindness Design Team blog hop. Our theme today is Because We Care and it such a fitting theme for this time of year when we have so much opportunity to care for others. I have a few different things to share with you today and I'll be the first to say that my photos aren't spectacular as I hadn't actually planned to share these first two (until I realized that they fit this theme perfectly), but, stay tuned for a third project with a VIDEO TUTORIAL (bottom of post). I live in a tiny, little mountain town in California, USA. Our town's recreation department recently purchased an abandoned country club with the intention of turning it into a rec center for our community to use. This would be so great for our community as our summers are hot and we do not have a community pool. It would also be fantastic for our local youth to have a safe place to go for summer activities. Now that the property has been purchased the Recreation Department is in desperate need of funds to renovate the property. Our town held a fundraiser (an epic Chilli Cookoff!) with a huge raffle to try to help the Rec Department out. 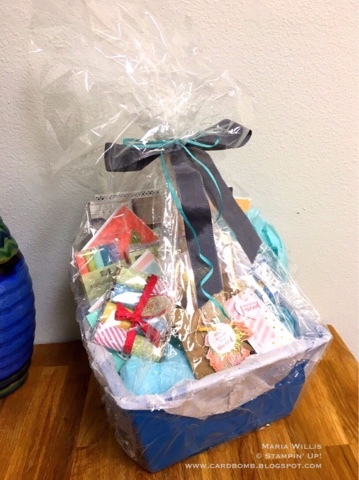 I donated a huge stamping/crafting basket and a gift set of cards to the raffle. My basket was full of card and project kits many of which were put together from leftover Paper Pumpkin Supplies. I also added Stampin' Write Markers, adhesives, embellishments, some finished cards and projects and some treats as well (chocolate). I have no idea who won it but I sure hope they loved it! Here's a pic of the card set I donated. It was a set of four different customs cards. I closed them up in an acetate box and added a belly band to pretty it up. I also did something fun at the On Stage event in Salt Lake City, Utah this past month that I think fits the theme of "Because We Care." There is of course a small back story... Earlier this year (April) I attended the OnStage event in San Diego. I had been selected as a stamper for one of the Display Boards and I spent the time leading up to the event stressing out about creating pretty things for my display board. I didn't have time to prepare swaps and I decided that I would just have to be ok with that. But, guess what...? My heart was absolutely melted by the kindness that so many showed to me that day. Many people asked me to swap with them and of course I didn't have anything to give. The first time that someone smiled huge and pressed a beautifully wrapped chocolate bar into my hand and told me to "take it anyways..." brought the hugest smile to my face. And folks, it didn't stop there. Many more people gifted me beautiful handmade creations throughout the day. I went home feeling so happy, so lucky, to be part of this beautiful community. This time as I prepared for OnStage I had originally decided not to do swaps because I was so busy and didn't need the stress. But then I remembered the kindness I had experienced in April and decided that if I could only get ten swaps done then hopefully that would be enough to put a smile on a few people's faces. I suddenly felt that it was really important to pay it forward. I ended up making over fifty "swaps!" Of course, they didn't end up being swaps as I gave them away to anyone who wanted one. Thirty of them were these treat boxes that I'm sharing with you today. The other 20-30 were smaller and had sticky hands inside (I love sticky hands!). Anyhow, the most special part of my day came when I was explaining why I was just giving my swaps away to a table of people. I explained how good I felt being the beneficiary of other people's kindness and that I just wanted to do the same. I was Paying It Forward I guess. One woman at the table was so thrilled! She was so happy and excited that she said she was gonna do this same thing at the next OnStage! How cool! I plan to do it again too as seeing people's happy faces as they received an unexpected gift was really quite the treat. Ok, I'll stop rambling now. Here's my project. Each of these little boxes held a Hanuta treat, was wrapped with a DSP belly band and had a touch of Black Shimmer Ribbon popping out the side. 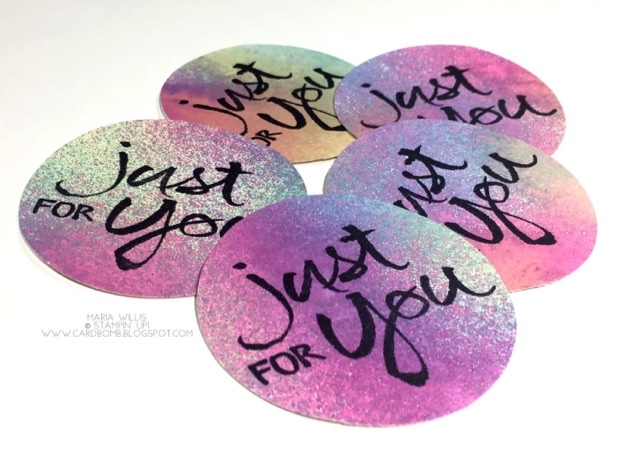 The sentiment pieces were stamped with Basic Black Archival ink onto Shimmery White Cardstock and spritzed with Island Indigo, Lemon Lime Twist and Berry Burst (rubbing alcohol mixed w re-inker in a spritzer). Please not that if you got one of these from me and your colors blended more than splattered like these examples.... It's because I accidentally refilled my re-inkers with water and it does give a different look than the alcohol mixture does. So, some of my sentiment pieces had a splatter look and some of them blended and bled together a bit more. Want to see how I put these together and get some measurements too? Here's a quick video tutorial for you. 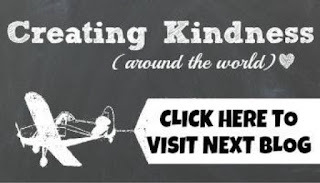 Enjoy, and then check out the description in my video to see a list of awesome videos from my Creating Kindess Friends. So glad to have you stop by today and I'll see you back here soon! 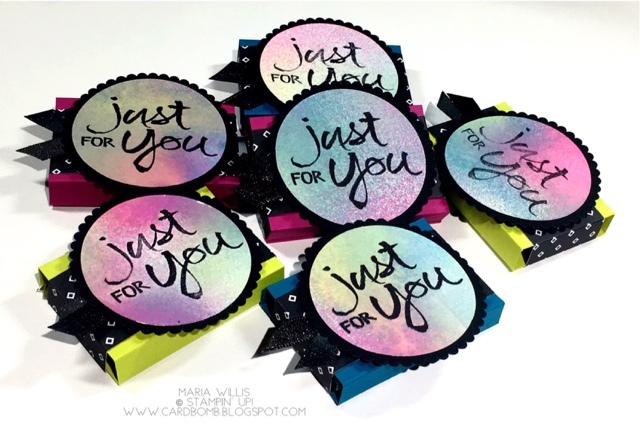 I hope you'll continue the hop by clicking the button below and heading over to see what the fabulous Cheryll Miller has made to share today! I absolutely love your spritzed treat boxes! I may have to try that technique soon! Aaaw, that is such a lovely story about your "Paying it back" experience Maria! And such beautiful little gifts! And what a fantastic prize donation to help raise funds for a community project. Good luck with getting the rec centre up and running. Being as my boys were recipients of these sticky hands boxes, I can say they are little beauties! And the sticky hands are just all around fun. Thanks for sharing your story and your creations, Maria! Love those little gifts and the spritzed labels. How cool!